The Rory Gallagher International Festival is back for a very special year, what with it being Rory’s 70th Birthday this year. It’s taking place from the 31st May to the 3rd June and this year it has a cracking line up for fans of the blues and rock n roll legend. They’re rounding the troops up with Band of Friends (Gerry Mc Evoy, Ted McKenna and MarcelScherpenzeel) headlining. Another legendary musician is playing the festival this year too. That legendary drummer is Thin Lizzy founding member Brian Downey and his band Brian Downey’s “Alive and Dangerous”. With Brian, Band of Friends, Wilko Johnson and many other internationally renowned musicians playing, it will be a 70th bash to remember! With this in mind we decided to compile a list of places for you to visit on your Ballyshannon based Rory Gallagher Trail. Rory Gallagher Place was developed by Barry O’Neil, who is also the director of the music festival. Rory Gallagher Place is located in East Port and it’s a popular place for fans of the musican to visit. 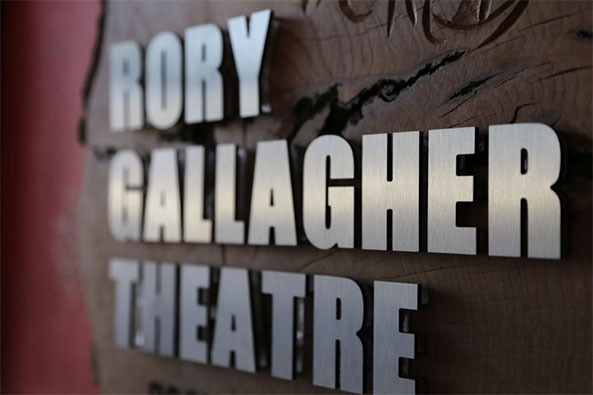 In 2005 The Abbey Centre in Ballyshannon, Co Donegal was renamed The Rory Gallagher Theatre in Rory’s Honour. It has a wood carving of Rory on it’s wall and not only does it celebrate Rory but it also hosts some of the Rory Gallagher Festival each year. When down in Ballyshannon you must drop into Rock Hospital, where Rory was born. Yes, he was born in Rock Hospital where there is a plaque commemorating him and this contribution to music. You can read more about the plaque at rock hospital here. The Hospital has since turned into a Nursing Home but music fans are allowed visit the location all year round. Ballyshannon District Museum turned 5 years of age this year and has a section dedicated to Rory Gallagher with some framed photos and replica Rory Gallagher Guitars. Theses photos was sent to us by Déaglan Penston, who is posing with a replica of Rory Gallagher’s Fender Stratocaster. Then, he’s posing with Kevin Gallagher at their Rory Gallagher display. The Ballyshannon District Museum features many apsects of the local are such as the railways, the Erne River, has a military room and a coffee shop. Well worth a visit during the festival! It was June 2nd 2010, that Ballyshannon town , along with the help of Donal Gallagher, Rory’s Brother, unveiled the Rory Gallagher Statue. This statue was sculpted by Scottish artist David Annand. It was commissioned by Donegal Count Council and the Rory Gallagher Festival to mark the fame of Rory Gallagher, the dedication of his international fans, and the success of the festival. 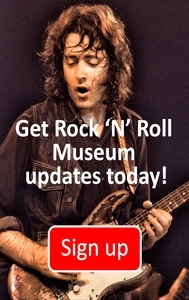 We’re offering 20% off to all visitors to the Museum with a ticket to the Rory Gallagher Festival. Show us your ticket at reception and book in to learn all about Irish music history. You can also check out more about the Rory Gallagher Festival here. 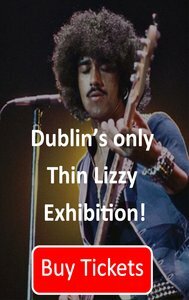 If you’re not going to the Rory Gallagher Festival and you’re Dublin based you can check out our Top 5 Rory Gallagher Songs to sooth your soul and for what Dublin based Rory Gallagher spots you can visit.